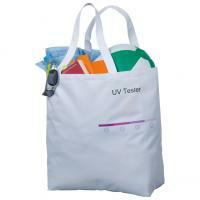 "UV tester" beach bag: The colour indicator changes to a darker colour when UV risk factor is higher. Made from heavy-duty polyester. Show your clients you care about their health!